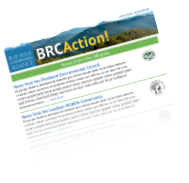 The geographic area of focus for the Blue Ridge Conservation Alliance (BRCA) is that stretch of the Blue Ridge Mountains and the surrounding countryside between the northern boundary of Shenandoah National Park and the Potomac River. From north to south, this area encompasses about a 50 mile stretch of the Blue Ridge Mountains located within Jefferson County, West Virginia and Clarke, Loudoun, Fauquier, and Warren counties in Virginia. In general, the BRCA sees the area west to the Shenandoah River and east following a string of designated Virginia Scenic Byways (Mountain Road (VA 690), Woodgrove Road (VA690), Airmont Road (VA 719), Atoka Road (VA 713); Rectortown Road (VA 710); and Crest Hill Road (VA 647)) as lying within the BRCA’s sphere of interest The BRCA recognizes, however, that the influence of the Blue Ridge extends far beyond its base, considering–for example–the connection between the mountain’s water on downstream drinking water supplies or the extent of scenic vistas of and from the Blue Ridge. Given the influence of the mountain, the demarcation of this BRCA Focus Area is to provide a practical framework within which the BRCA can operate and is advisory only. Therefore, subject to guidance from the BRCA steering committee, the BRCA may take up policy issues and/or pursue conservation initiatives that further the BRCA mission but extend well beyond this BRCA Focus Area.